The NSE Nifty closed with a loss of 46 points at 7,486. 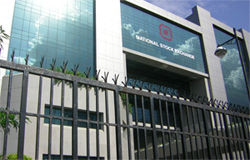 The NSE Nifty opened at 7,545 hitting a high of 7,547 and low of 7,447. The India VIX (Volatility) index was up 1.57% to 17.7800. In broader market with the benchmark indices with the BSE midcap and smallcap indices closed down 0.31% and 0.16%. Finally BSE Sensex ended with a loss of 171 points at 24,623. The BSE Sensex opened at 24,815 touched an intra-day high of 24,817 and low of 24,471. The NSE Nifty closed with a loss of 46 points at 7,486. The NSE Nifty opened at 7,545 hitting a high of 7,547 and low of 7,447. The India VIX (Volatility) index was up 1.57% to 17.7800. In broader market with the benchmark indices with the BSE midcap and smallcap indices closed down 0.31% and 0.16%. The Indian Rupee was trading up by 19 paise at 67.20 per US dollar. On the global front, China's Shanghai Composite index closed cracked 2% and Hang Seng closed marginally down. In Europe, the FTSE 100 marginally down 0.33%. On the other hand, DAX and the CAC 40 were trading marginally down. Carin, Hindalco, HDFC, Asian Paints, Maruti Suzuki, Cipla and Bharti Airtel were among the gainers on NSE, whereas RIL, Infosys, BHEL, Bank of Baroda, L&T, GAIL and SBI were among the losers today. Out of 1,795 stocks traded on the NSE, 774 declined and 725 advanced today. A total of 10 stock registered a fresh 52-week high in trades today, while 15 stocks touched a new 52-week low on the NSE. At 3:01 PM, the S&P BSE Sensex is trading at 24,618 down 175 points, while NSE Nifty is trading at 7,483 down 47 points. The BSE Mid-cap Index is trading down 0.20% at 10,274, whereas BSE Small-cap Index is trading down 0.11% at 10,303. Expectations are of a further stimulus by ECB. Oil has seen a rebound. Although China is down due to higher than estimated food prices data published, many other Asian indices are up as global money lying idle has been buying in anticipation of measures to boost growth by Asian economies. Back home, rate cut action by RBI is also anticipated after the government achieved the fiscal deficit target. Going forward, the rally could soften as and when the Nifty approaches 7600. Maruti Suzuki, Cipla, NTPC, Tata Steel, Coal India, HDFC and ONGC are among the gainers, whereas BHEL, Infosys, RIL, L&T, ITC and GAIL are losing sheen on BSE. Some buying activity is seen in metal and consumer durables sectors, while capitsl goods, IT, realty, energy and FMCG sectors are showing weakness on BSE. The INDIA VIX is up 4.05% at 18.2150. Out of 1,793 stocks traded on the NSE, 871 declined, 608 advanced and 314 remained unchanged today. A total of nine stocks registered a fresh 52-week high in trades today, while 11 stocks touched a new 52-week low on the NSE. Cabinet has approved policy on hydrocarbon exploration. Cabinet has cleared premium pricing for new gas from deepwater fields and it gives pricing freedom on gas from difficult fields. The Indian rupee opened lower by 3 paise at 67.24/$ on Thursday as against previous close of 67.21/$. On Wednesday, rupee gained by 14 paise against the greenback to close at 67.21 on fag end selling of dollars by banks and exporters amid sustained foreign capital inflows. Buying was evident in the domestic equity space as well. DHFL jumped 3% to Rs.182.50 on BSE. The company received an approval to raise funds up to Rs 5,100 crore, subject to market conditions, by way of a secured or unsecured debt issue by means of a private placement or listed on any offshore or onshore Stock Exchanges. The board of directors at its meeting held on March 09, 2016 has approved for the same. Monsanto India climbed 3.4% to Rs.1,662. India on Wednesday cut prices of genetically modified cotton seeds and slashed royalty fees by 74%, disregarding global seed major Monsanto Co.’s threat to re-evaluate its India business if such a move is considered. Hero MotoCorp trading lower at Rs.2813 on BSE. The company has declared interim dividend of Rs. 40 per share. Reliance Infrastructure gained 1% to Rs.520.25 after its arm got 12 industrial licences from DIPP. DIPP has approved 12 industrial licences to Reliance Defence, an arm of Reliance Infrastructure, for manufacturing of a wide range of defence equipment. The licence approval by the DIPP for strategic business units (SBUs) of the company is aimed at addressing defence programmes in India and overseas. Corporation Bank gained 0.8% to Rs.41.20 on plan to raise funds up to Rs. 1,000 crore. Jindal Steel & Power climbed 3.2% to Rs.67 after the company has informed that the company has fixed March 19, 2016 as the record date for the purpose of payment of interest and redemption of NCD. Infosys slipped 2% to Rs.1156 on BSE. Around 78 lakh shares were traded in a multiple block at Rs. 1150.75 on the BSE and NSE. The stock is top losers on NSE. Infosys shareholders to offer 7.5m shares at Rs. 1,149.0-1,178.5 each in a block deal. Selling Shareholders include names like S Gopalakrishnan (5mm shares), S D Shibulal (1mm shares), Kumari Shibulal (1mm shares), and Shruti Shibulal (0.5mm shares). KSK Energy Ventures jumped 6% to Rs.42.10 on BSE. The company in talks with Foreign Strategic Investors and two Indian Power Company, as per TV report. Coal India Ltd stock was up by 1% at Rs. 324. Report says that the company management is likely to meet the protesting unions next week over the issue. ICICI Bank Ltd advanced 1% to Rs.218. Moody’s Investors Service affirmed its ratings on ICICI Bank due to the healthy capital adequacy of the country’s largest private sector lender despite some reverses on asset quality. Oil and Natural Gas Corp. Ltd rose 1% to Rs.207.25. The company has announced a dividend of Rs.0.75 a share.